Frugal living is all about small luxuries. That's what I tell myself when I buy an $8 bag of Fresh Market coffee, 4x a year. Pumpkin Spice is our favorite--as it evidently is for the rest of the city. Buy it when you see it, 'cause it always sells out. Since I don't drink coffee, my husband thinks this gesture is all about making him feel loved. Yes, yes, yes, of course. The real reason I'm so eager to pick up a bag? Pumpkin Spice makes the kitchen smell great. I love the smell of brewing coffee. I don't doubt that pumpkin spice is divinely scented. My luxury drink is Whittard of Chelsea's English Rose tea. I am in love with the stuff! So much so that when my parents went back to London in the spring, I had them bring me back several (6!) boxes of it. And it's so good that even if my parents didn't frequently go to London to visit their grandchildren, I'd pay to have the stuff shipped from England. It's that good. Our frugal luxuries: eggnog for dh, and nutella for me. The eggnog only comes out between October and January, and yes, I'm aware that there are some great recipes for homemade eggnog, but dh likes the Southern Comfort brand, so that's what we get. Nutella, well that's just Mom's guilty pleasure. That sounds delicious. I love coffee and enjoy the smell of it as well. You are right too. That coffee brewing makes the whole house smell good. Kind of like bread baking..makes the whole house smell wonderful. I just had my once a year Starbucks treat today - pumpkin spice latte. MMMMMM! Put 1-2 scoops of your luxury" coffee flavor into the reg coffee when you brew it. It makes your purchase last longer,the flavor is not as strong and the smell is still in your kitchen. i do this alot. 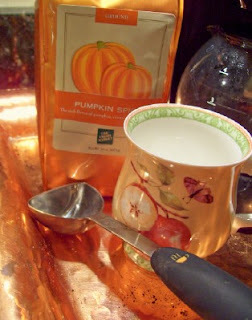 I am a pumpkin spice addict! I just posted a blog about it today.